I had a chance to play in Sparkle's Christmas Card Challenge Week #7, which is a sketch challenge (yea!). I used one of my favorite Taylored Expressions Cuppie images from Season's Sweetings. I colored my plain chipboard snowflake and the "cherry" atop Cuppie with my R89 Copic marker. Accessories: Square Nestabilities (Spellbinders), Scalloped scallop border punch (EK Success), Markers (Copic), Chipboard snowflake (Maya Road), Rhinestones, Foam tape, Thread, Sewing machine. Cute, cute, cute! 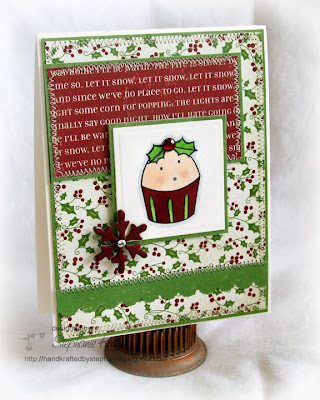 I love that adorable cupcake image, such a pretty card you have created with it. Such a darling card. That cuppie is just too cute. Hope Sabrina feels better soon! Totally FAB Stephanie! LOVE your coloring on Cuppie and the papers are awesome too! This is such a yummy card! Love it!